WASHINGTON (AP) ― The Hubble Space Telescope has peered back to a chaotic time 13.2 billion years ago when never-before-seen galaxies were tiny, bright blue and full of stars bursting to life all over the place. Thanks to some complex physics tricks, NASA’s aging telescope is just starting to see the universe at its infancy in living color and detail. Images released by NASA on Tuesday show galaxies that are 20 times fainter than those pictured before. They are from a new campaign to have the 23-year-old Hubble gaze much earlier and farther away than it was designed to see. It was a time when star formation was ramping up, and it was far more hectic than now. There were probably no metals at this time, no Earths, said Illingworth, who was on the scientific team using Hubble. “Things look clumpy and kind of weird,” Lotz said. Most of the galaxies then were close to 1,000 times smaller than our Milky Way, but astronomers said they were surprised to discover a few brighter, bigger galaxies sparkling out there. These first pictures showed nearly 3,000 galaxies. Astronomers are still trying to figure out which of those galaxies are ancient and which are more recent. Because light travels nearly 6 trillion miles a year, as telescopes look farther from Earth they see earlier into the past. While Hubble and other telescopes using different light wavelengths have seen this far back, this is the first complete set of photos in the visible light spectrum that the human eye sees. 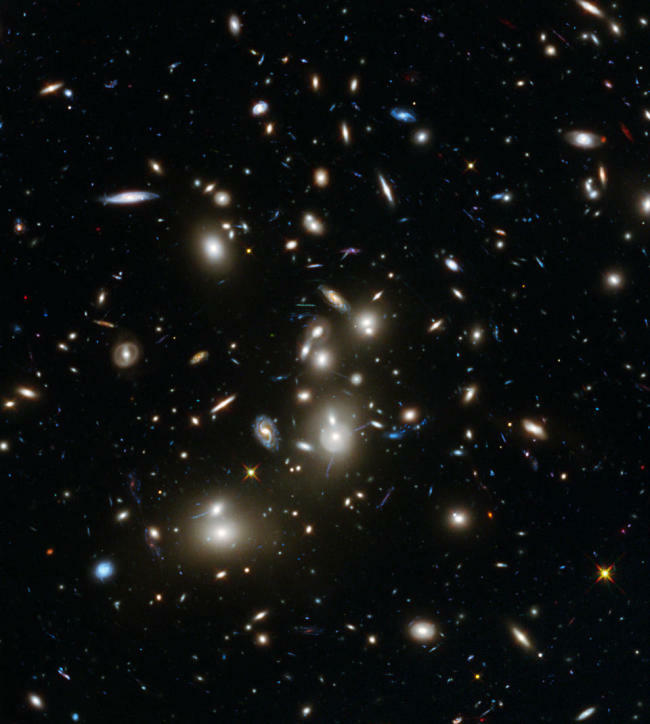 To do this, Hubble is using one of Albert Einstein’s concepts that massive clusters of galaxies have such super gravity that they magnify and stretch light, Lotz said. By focusing on clusters, astronomers use them as natural binoculars to see what’s behind them. The release of the images is significant and important, said Christopher Conselice, a professor at the University of Nottingham in England. Conselice was not part of the Hubble team.